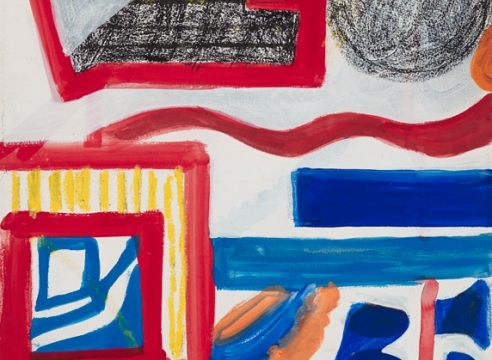 The Tibor de Nagy Gallery is pleased to present its sixth exhibition of works by the 92 year old Paris-based American abstract painter Shirley Jaffe. The exhibition will comprise a group of mixed media works on paper from the last decade. Characterized by her signature colorful shapes and scriptive overlapping lines, most of the works in the show have never before been exhibited in the United States. Though the works on paper sometimes inform her oil paintings, Jaffe does not consider them studies. They exist quite separately and provide her with the freedom to experiment. There are rarely hard-edges like the paintings and they are open and improvisational, while the paintings are carefully considered over time. The artist arrived in Paris in 1949; in the decades that followed, Jaffe established herself among a circle of American artists living in Paris including Sam Francis, Ellsworth Kelly, and Joan Mitchell. Many critics have drawn stylistic parallels between her paintings and the work of Henri Matisse, to which she was exposed in post-war Paris. Jaffe has enjoyed an increasing international following in recent years. The artist’s work has been the subject of over twenty-five gallery exhibitions in Europe. 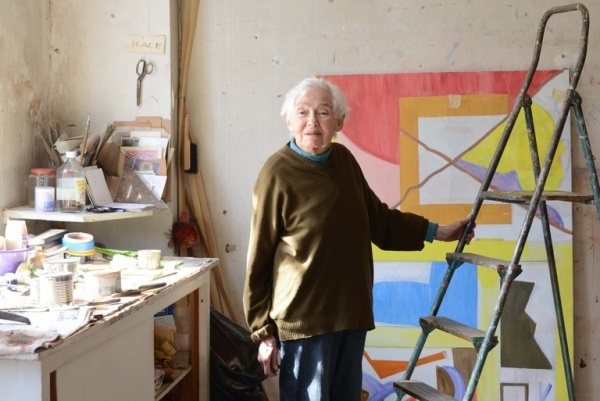 A twenty-year survey of her paintings was presented at Musee d’art Moderne Ceret in 1999, and in 2008 a comprehensive exhibition of her work was presented at the Domaine de Kerguéhennec. Her work is in the permanent collection of the Museum of Modern Art and the Centre Georges-Pompidou, among many others.
" For the next half-century, working in a small apartment-studio on the Left Bank, Ms. Jaffe refined and extended her inquiries into the drama of form and color — always at a distance, literally and figuratively, from the currents of American art."